> "Defeat Cancer....Like I did Twice!! With No Chemotherapy or Radiation"
"Defeat Cancer....Like I did Twice!! 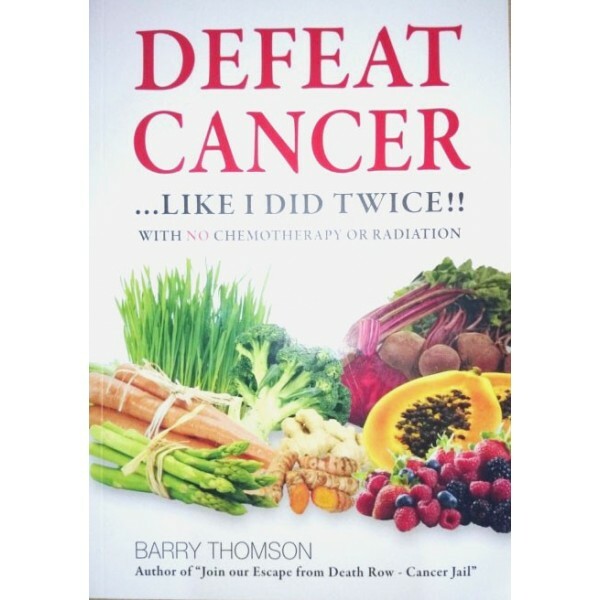 With No Chemotherapy or Radiation"
This book continues the story of my journey with cancer, and subsequent cancer-fighting experiences, and also provides a wealth of additional and valuable new cancer-fighting information I have obtained since I published “Join Our Escape from Death Row – Cancer Jail” in late 2007. My first book told how I devised a regimen of natural therapies to defeat, with each one normally proving terminal, two simultaneous Clark Level 4 and Clark Level 5 primary melanomas diagnosed in April 2003 – now more than ten years ago. An HONEST oncologist set me on the path to becoming cancer–free when he told me that chemotherapy and radiation are ineffective against melanoma. My only remaining option was to seek a cure utilizing natural therapies. I found my own cure within Mother Nature and wrote “Join Our Escape from Death Row – Cancer Jail”. See my first website: www.cancerjailescape.com. I battled terminal cancer for a second time in June 2008. I was diagnosed with bowel cancer which totally blocked my large bowel. I underwent successful surgery to remove the tumour but, due to twists in the small bowel preventing intake of food, I underwent a second emergency surgery twelve days later. Extremely ill, I spent four nights in Intensive Care and was lucky to survive. I spent a total of 33 nights in hospital. After I returned to my ward from Intensive Care, Dr. Matthew Carmody, my surgeon, told me that “100% definitely” I had cancer cells in my lymph system. He strongly recommended six months of chemotherapy for a “27% better chance of beating my cancer. I replied “That is ‘stuff all’. In any case I do not need that rubbish because I am quite capable to eliminating those cancer cells myself.” I have never seen a more astonished man! In this second book I tell how, after returning home to utilize my successful anti-melanoma regimen to eliminate bowel cancer cells, I had to undergo a third major surgery in March, 2009, to rebuild my stomach and repair an incisional hernia and abdominal muscle separation. (I had not properly healed, being very sick, when I had the second bowel cancer surgery.) CT scans in February, 2009, showed that I was cancer-free. Colonoscopies in May 2010 and July 2012 showed NO POLYPS and NO CANCER. In July 2012 Dr. Carmody told me “Forget bowel cancer. You have certainly beaten it. See me again in six years for the sole purpose of checking for polyps with a colonoscopy.” It is now more than five years since my original diagnosis of bowel cancer. Since early 2004, by following my anti-cancer regimen, people have defeated a wide range of cancers. These include bowel cancer, non-malignant brain tumour, aggressive T-cell lymphoma, tumours throughout the head (gone in three months), bladder cancer, pituitary gland tumour and stage 4 ovarian cancer. I have received reports of other cancer successes but do not have specific details. After defeating melanoma and bowel cancer, I continued my research to find more and more effective natural cancer attackers. I gained a wealth of new and superb cancer-fighting information. In 2010, I felt it would be appropriate to write a second book to share this additional knowledge I had acquired with people fighting cancer. It seemed a simple matter to write a second and updated cancer-fighting book. It did not turn out that way. Writing this second book has been a surreal and unbelievable experience. It has taken three years of continuous work to write this book. Amazing and incredible cancer-fighting information, month after month, kept coming to me from a network of friends involved in natural health, both in Australia and the United States of America. I also had additional successful cancer-fighting experiences in this three year period and they have been detailed in this book. This book, thanks to “alerts” and contributions from many friends in natural health, is a far better and more informative book than I ever envisaged it could become when I first started to write the book. comprehensive information contained in this book. I offer an unconditional refund of the purchase price of this book if you are not satisfied with your purchase.